The night before we were due to go to Ascot, I completely panicked, and decided that the lack of a suitable hat, and the girls' footwear situation (a choice of flipflops, school shoes or grubby crocs) meant we couldn't possibly go. The clincher was the fact that Tom had recently given his few remaining ties to a charity shop. So with flowers in our hair, the girls' best flip flops, and a tie borrowed from our farmer neighbour, we set out for Ascot at the crack of dawn. Tom moaned about having to wear a tie, and argued that he hadn't even worn one at our wedding. I reminded him of the upset that that had caused, and told him he was bloody well wearing one today. It was quite a long walk to the ticket office from the car park, and by the time we got there my shoes - last worn at my wedding - had left my feet black and blue. When collecting the tickets there were people on hand dressed in full finery, with top hats and everything, and I started to panic again. But then I noticed there were also ladies not wearing hats (or even flowers), and I even spotted a few in casual summer sandals. So before we were even inside the gates I had swapped my shoes for my trusty Birkenstocks. And I whipped the flower out of my hair and plonked my Asda sunglasses on my head instead. What I hadn't realised is that there is a smarter dress code in the boxes, and the more champagne I had, the more I felt the need to explain in great detail to beautifully dressed ladies wearing incredible hats and shoes, why I was wearing Birkenstocks. Quick to change the subject, the lovely marketing lady asked me if I liked horses. 'No, I hate them. But I love champagne,' I told her. Dolly, my ever diplomatic five year old, felt the need to explain to her that it wasn't just horses that I don't like, but all animals. And in fact it was because of my hate of animals (a cockerel attack, resulting in a broken leg) that I had had to wear Birkenstocks in the first place. After a delicious lunch, and more champagne, and meeting really friendly guests and their children sharing the same box as us, we were taken down to meet Ant and Dec, who are Patrons of Ascot’s Colts and Fillies Club for under sixteens, for a questions and answers session. Betty had decided that she was going to ask Ant if he likes ants, and Dolly was going to ask them what their best horse joke was. Some poor bloke wandered past in a large furry horse costume, while next to him a minder hissed ‘Just keep waving,’ and I thanked my lucky stars I wasn’t required to dress as a horse on this hot day. 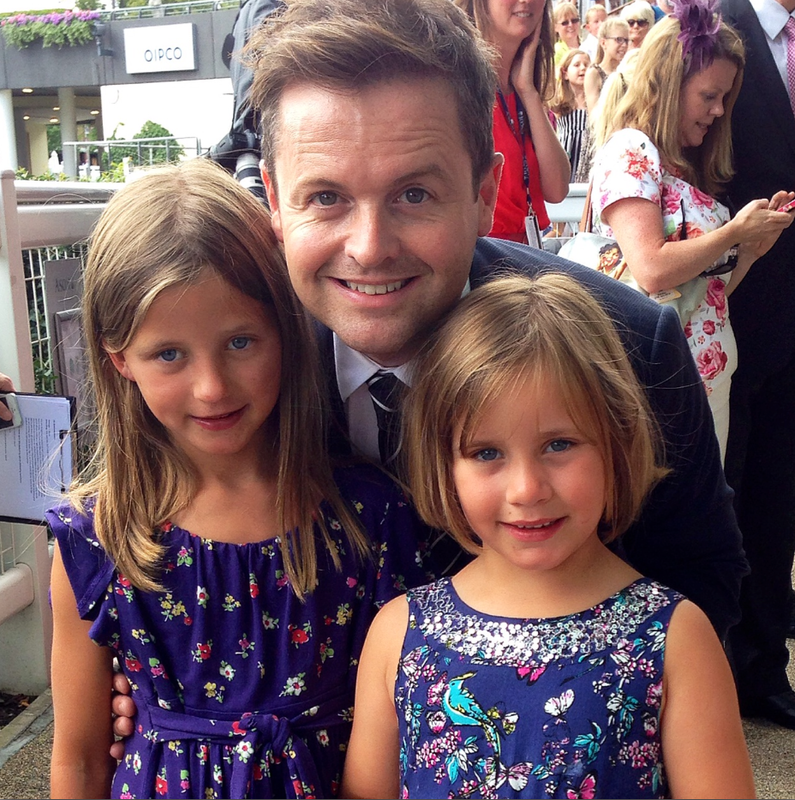 I took several pictures of the girls with Ant and Dec, and (insensitively) told them that my girls had no idea who they were, but that I really admired their work. They were such warm funny people and I would have loved to have stolen them for an hour to two to see what they could do. My girls were pretty taken with them too. I promptly put the photo I had taken on Facebook, causally mentioning that I was hanging with Ant and Dec at Ascot. I think it caused a lot of confusion with my friends back in Herefordshire. 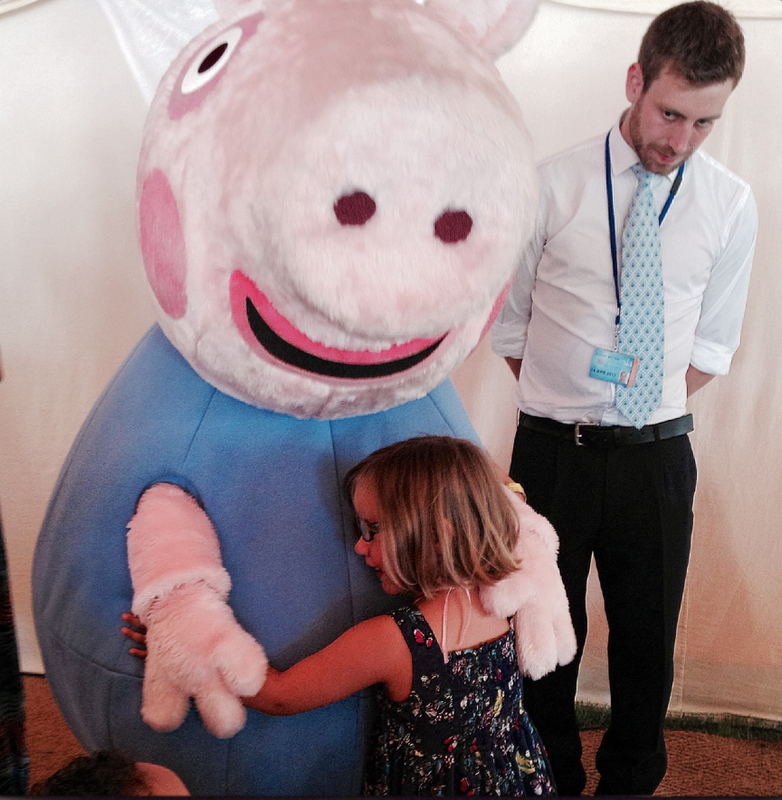 Meeting Ant and Dec was a tough act to follow, and the girls seemed less than enthused about meeting Peppa Pig and George, characters who Dolly still absolutely adores, as do the rest of us. I was very excited, and bellowed a little too aggressively 'GO ON, CUDDLE GEORGE SO THAT I CAN TAKE A PICTURE' while thrusting Dolly through the crowd of mini fans. Dolly gave George (also extremely hot in a giant padded outfit) such a massive embrace he almost toppled over, and his bodyguard looked a bit worried. There were so many things to do, including different fair rides like the big wheel and merry-go-rounds, and various activities including pompom making and feeding meerkats. And everything was free, which is virtually unheard of these days. We had been at a water theme park in Spain just a few days before and were fuming, that after paying a hefty entrance fee, we were charged 5 Euros just to sit on some grass. Despite loads of wonderful things to do and see, I was a bit irritated that here we were at Ascot and all my children wanted to do was hang out in the loom band making tent - having spent the last two months hiding under their duvets at night making endless loombands. ‘Please come and say hello to Ben and Holly with me,’ I begged them at one point, pointing to a very jolly-looking pair in their massive costumes. A highlight for me was meeting a jockey dressed in full silks, watching him get weighed, and then watching him in several races. I got a photo of him with my children (while he stood on the scales, with a complex expression on his face) and then more pictures of him racing. I felt I knew him pretty well by the end. 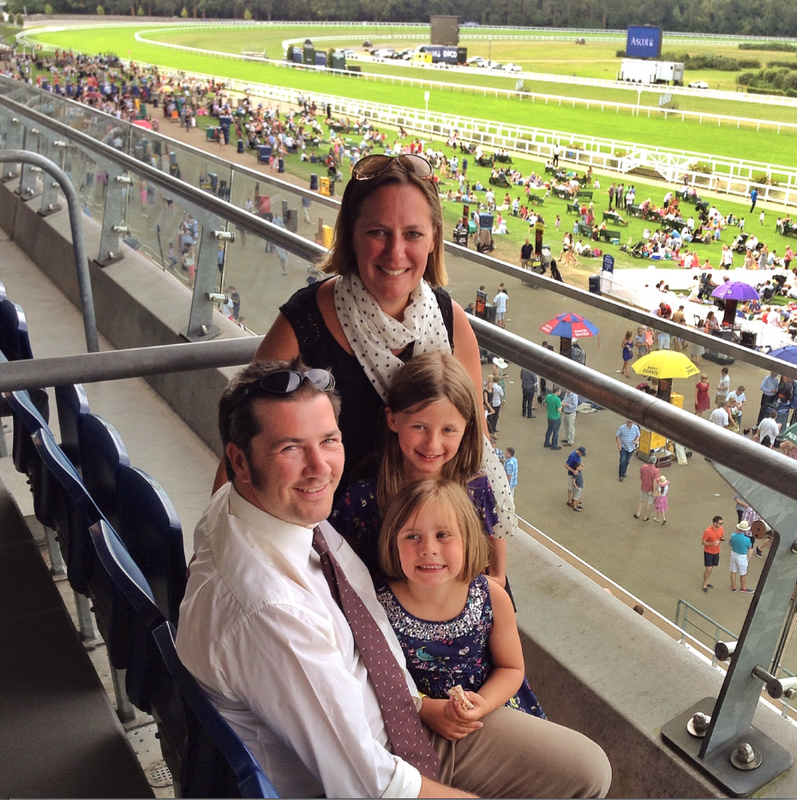 I have never been to the races before and if we hadn't been invited by Ascot to come along to their King George Family Day, I would not have dreamt of going. But we had such a truly wonderful day, and although there were many exciting things going on, the best part for me was actually watching the races. And both girls are now seriously into Ant and Dec and are following their career very closely and watching back episodes of I'm a Celebrity and Byker Grove. 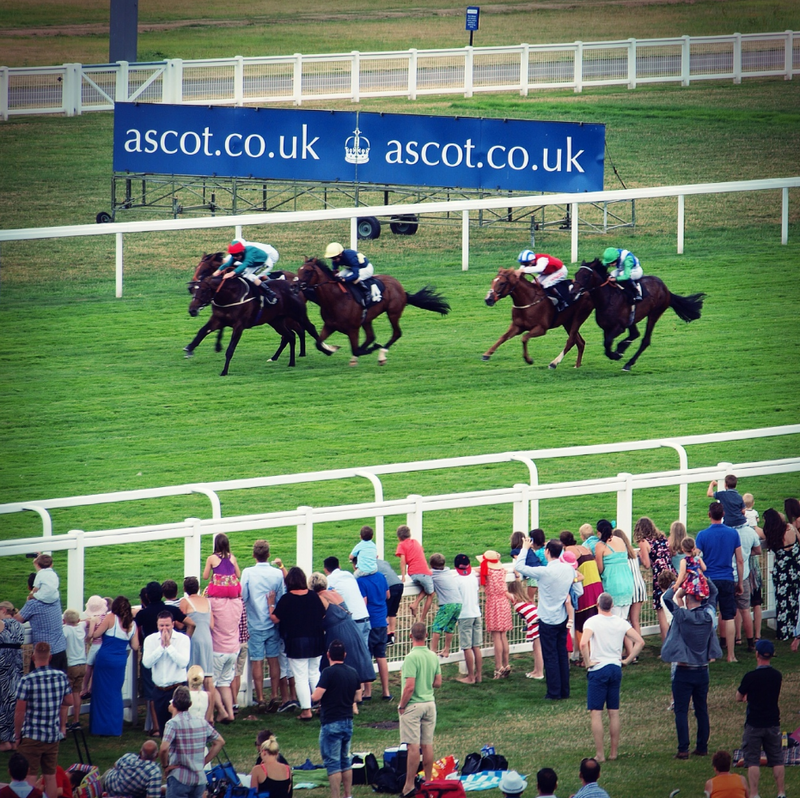 Thank you Ascot for a fabulous day – and I no longer ‘hate’ horses, I bloody love them! How fab does that sound? I'm a big fan of Ant and Dec. Would love to meet them. I've been to Ascot a couple of times with work, but never met any celebrities!